Natalie’s sister Lola has climbed a tree, and she won’t come down. She says she’s at the treetop wedding of Fizzy Izzy the tooth fairy and Solomon the spider. Then Grim the goblin starts throwing acorns, and turns poor Fizzy Izzy into a hedgehog! 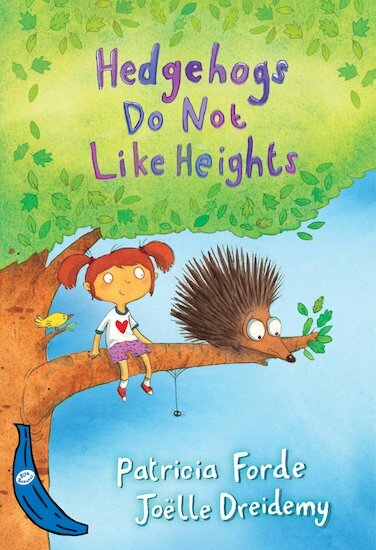 And, as everybody knows, hedgehogs don’t like heights… As the drama in the tree escalates, Natalie and her family call out the fire brigade and an ambulance to help. But just as it seems that Lola may be totally stuck, a friendly witch has a handy spell up her sleeve… A hilarious caper from the popular Blue Bananas series, combining an accessible text with vibrant colour pictures and bags of imagination! 560L Lexiles are the global standard in reading assessment. They are unique as they are able to measure a child and a book on the same scale – ensuring the right book gets to the right child at the right time. This is a very funny story and I love the pictures. Lola climbs a tree and her parents try to get her down. An ambulance and some firemen come. But only a witch can help!